This week we have a sketch challenge at Just Add Ink. Check it out. Now I've flipped it and taken a bit of a liberty with the sketch but I really love how it's turned out. 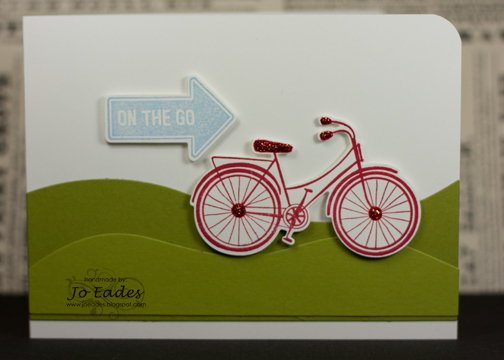 I fell in love with this stamp set, which has a coordinating framelit die, during the Clean & Simple class I took with Online Card Classes. I don't know what it is about it, because I've never felt the need for a bike set before, but it's just so super cute that I HAD to buy it. Being a framelit die, I found it was easiest to stamp the image first then centre the die over the top. The hills are cut from Old Olive (back) and Lucky Limeade (front) using the In the Meadow die collection from PTI. Again, as soon as I asw this die set I knew I had to get it because there is just no way that I could ever make hills like that. It's a lesson I learnt early - know your limitations and buy something to overcome them, lol! That's why I stamp - because I can't draw to save myself. And of course, no bike would be complete with out some bling - Candy Cane stickles in this case. That's it from me, thanks for visiting and be sure to check out the rest of the DT's interpretation of the sketch. I look forward to seeing your take on it. Supplies Used: All Stampin' Up! unless noted otherwise. Totally love this Jo. I don't have a bike set either but am drawn to them for some reason. Must remedy that! Love that you know your limitations - if there's a die to be had then I'll have it too. And here I was thinking you were the master at fussy cutting lol. Oh this bike is such a cool image and the bling looks fab!!! What a great interpreation of the sketch and I agree a bike needs a bit of bling! Jo - I love your take on this sketch! The bike is really cool and I initially thought you'd cut it out by hand! Love your hills - they look amazing! Very cute, Jo! Love your take on the sketch.